Имате въпрос към Mudra Angkor Boutique Hotel? Сгушен в сърцето на Сием Реап - централен район, Mudra Angkor Boutique Hotel е идеалното място, от което можете да започнете Вашето приключение в Сием Реап. Този 3-звезден хотел е леснодостъпен, тъй като е само на 9 km от летището. С удобното си местоположение хотелът предлага лесен достъп до всички градски забележителности, които задължително трябва да се видят. Съоръженията и услугите предлагани в Mudra Angkor Boutique Hotel гарантират Вашия приятен престой. Хотелът предлага достъп до широк спектър от услуги като безплатен WiFi достъп във всички стаи, 24-часова охрана, ежедневно почистване, пощенски услуги, таксиметрови услуги. Дизайнът на хотела е съобразен с най-високите изисквания за удобство и комфорт, осигурявани от съоръжения достъпни в някои стаи като телевизор с плосък екран, стойка за дрехи, безплатно разтворимо кафе, безплатен чай, уелкъм дринк. Пълният списък от съоръжения за отдих е достъпен в хотела и включва открит басейн, масаж, градина. Mudra Angkor Boutique Hotel е най-подходящото място за Вас, ако търсите качествен хотел в Сием Реап. I trusted the reviews. This must be under new ownership. It was horrible. They have 3 listings. One for hostel, one for B&B and one for a boutique hotel. They make it appear as if they are 3 properties next to each other. It is all the same place. If you are booking the $9 hostel room... you will be thrilled. If you are booking the B&B or Boutique... RUN AWAY! You are allowed one towel, the pool looks like it is growing water lilies. We had to leave in the night to find another hotel. I did not feel safe. It was a depressing place to be. Siem Reap has so many beautiful people and places.. find that experience, but not here. Отседнахме 13 вечер/и в ноември 2018 г.
I've been traveling to Asia for over 6 years but it has been the worst hotel I've stayed. - they don't clean the room or you have to ask and remind so they will clean it eg. at 7 pm once you come back from the all-day trip and have to wait very tired or go for another walk - the pool was off for 10 days, they said it's going to take 2 days to fix it and every day repeated that it's going to be fine the next day... - the breakfast menu contains 12 positions but every day they had only 2 or 3 meals from the list, and every day I asked for a mango pancake which was on the menu and every day I got a response "sorry we don't have it today". And that's the same with other meals - we ordered a few times a banana pancake which was missing... a banana, so they bring you a fresh banana on a plate - you have to ask for the toilet paper and soap - sheets were old and damaged - ants were everywhere - cats were eating from the tables Very disappointing stay. Staff is polite and helpful, and I like their food too, very nice. Good and clean option for your stay in SR; pictures posted are not 100% accurate with actual situation of the hotel, but still is nice. 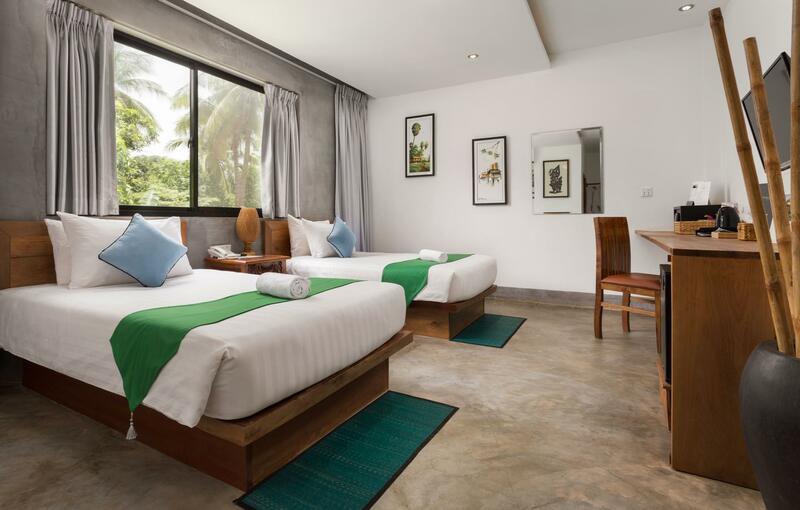 Located 10 mins by Tuk tuk from Pub Street, the area is quite calm and will let you rest from your days at Angkor Wat. Staff is friendly but not fluent in English; still, they will go that extra mile to make your stay pleasent and enjoyable. 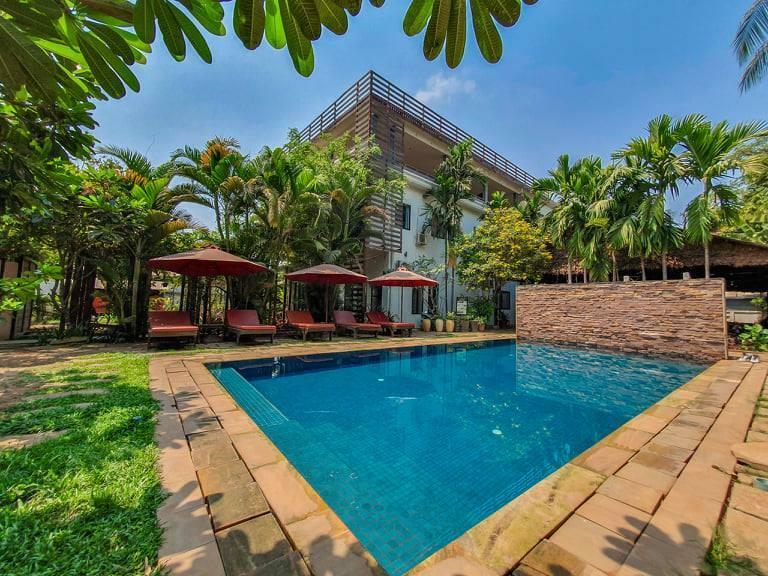 Located close to the road towards Angkor Wat. Need tuk-tuk to go to downtown tourists area or take a 20 mins walk. Staff are friendly. It's rather odd that there's no daily room housekeeping. Only 3 TV channels with very bad TV reception, and most of all no English TV channels at all - which makes having a TV in the room rather useless for tourists. Food from the kitchen is okay. Nothing spectacular about the hotel but it's a okay choice for a night or two. It is away from the hustle and bustle of Pub street, only about 15 minutes away from Pub street and 5 minutes from the Angkor museum. Nothing to shout about the room. Their restaurant does not sell draft beer. Breakfast is fine. However, swimming pool is not so clean but its due to trees nearby. The staff is usually multi-tasking. As such, we had to wait for almost 20 minutes to be greeted. Overall, just an average hotel. Dear Clearence, Thanks you so much for your feedback, we will take this as an improvement point so we can offer our best service to the next customers. Wish you all the best. Mudra Angkor Team. Lovely hotel, location is a bit further out but you get the benefit of it being a peaceful place to stay. Staff were polite and very helpful, hotel was modern and spotless. Would definitely recommend this hotel as an oasis during your stay in Siem Reap. Thanks you so much for taking your time to review your home away from your home. 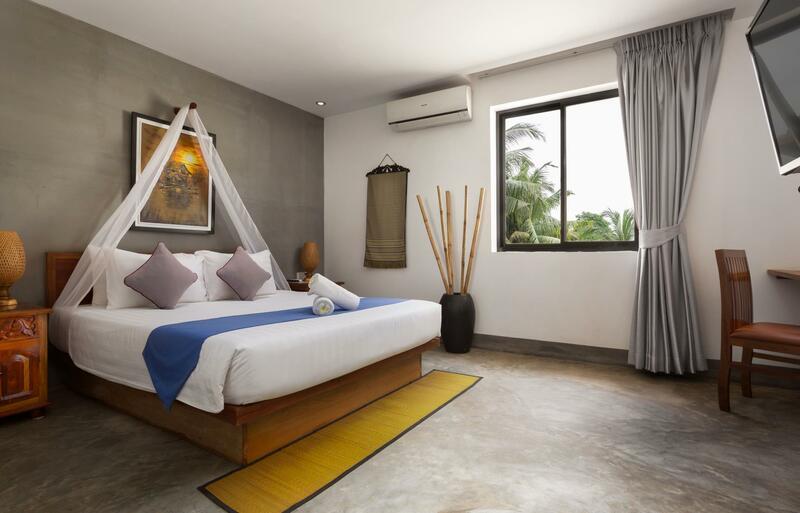 We love to hear everything is going well with your stay while in Siem Reap. Mudra Angkor Team. The hotel is located a bit outside of the center, which is a good thing if you want a quiet place and can be easily reached by a 5min tuktuk ride for about 2 usd. The room was clean, well decorated and had the amenities you could need. Breakfast was a la carte and it was OK, but the coffee was terrible. Staff is helpful and speaks English well. We stayed there only one night, our last in Siem Reap, as our original hotel was full. We were sorry, that we didnt stay there all time. Staff was absolutely best, location was away from downtown, so was very queit. Pool area was very nice, breakfast good. Room was nice and clean, we loved shower. Would stay again. Great price for a decent hotel. Helpful staff. 1) Location: it is alright. Not in the tourist area but walkable, about 15 mins walk to old market/pub street. 2) Pool: it is nice, big enough, clean and fresh. 3) Restaurant: excellent! Breakfast is set menu but they are delicious. We had dinner there a few times and we liked it a lot. 4) Room: main light on the ceiling was broken since we checked-in. Told the receptionist and she promised will get someone to fix the next day but NO ONE ever came. So our room is always quite dark during our 4 nights stay. (although there were some lights worked but not enough) Last day they didn’t even bother to clean our room. And the body gel was empty. 5) Staff: the receptionists are so lack of training. There was awhile they insist we hadn’t pay our tour that we booked through the reception which we did pay right when we booked it. And they were chatting having so much fun when I had questions. 6) Other: The tour we booked from the hotel is quite nice. The driver (Mr. Savin) is super nice and friendly. Highly recommend him. It’s a nice place to stay, if it wasn’t their staff are so unprofessional, I would like to stay at this hotel again. But well, sorry, their poor-discipline really made our stay unpleasant. Everything as one would hope. Large comfortable room, excellent restaurant, friendly helpful staff, well organised trips. Fantastic value. Would use this place again. Dear Guests, Thanks you so much for this lovely review. We are all glad to hear everything is well and fine with your stay with us. We wish you all the best. Regards Mudra Angkor Team. After booking this hotel, the day before my arrival I called from Bangkok to ask if they could pick me up from the bus station. I was a little vague with the details of my arrival as that depended on the time to clear immigration at the boarder, I guessed about 4pm. We arrived not at a bus station, but the office off the bus company, and there holding a sign with my name printed on it was a smiling tuk tuk driver. How's that for service? We arrived at the hotel and after a fuss free check-in were shown our room. Pleasant and clean it was, complete with flat screen TV, fridge and air-con. I loved the bathroom with a step in shower with a huge shower head and glass doors. No wet floor around the sink and toilet.We stayed 3 nights, unfortunately I didn't get to use the pool but it looked nice. We had a view of it from the upstairs dining area where we enjoyed the free breakfast, of which there was a good choice with orange juice and local coffee. I doubt if I will return to Siem Reap now Angkor Wat is ticked off the bucket list, but I will recommend this hotel to anybody who is going there. Great value, great service, quality establishment.